A day after an explosion rocked an Irving neighborhood, people are upset they aren't getting any answers to the question: Why were they allowed to stay in their homes with a natural gas leak nearby? Atmos Energy said the incident is under investigation but declined to answer any questions Tuesday. "We are in the process of gathering relevant information and facts," Atmos spokeswoman Claire Skillestad said in an email. "This process takes time." Asked if the company would share the results of its investigation, she said, "If we have any further statements, I will share them via email." Tuesday afternoon, NBC 5 received a statement from the Texas Railroad Commission confirming that it is investigating. "Protection of public safety is the Railroad Commission’s highest priority, and we dispatched an inspector to the incident site yesterday. We currently have an ongoing investigation into the pipeline operator’s compliance with pipeline safety rules." Atmos crews were in front of Stephenson's house in the 3500 block of Colgate Lane for hours New Year's Eve fixing a leak in a line under O'Connor Road. The family across the street said they asked the Atmos workers if they were safe, and were told three different times that they were -- before their house blew up. "They're the experts,” said Alejandra de la Cruz. “We're not going to evacuate if you tell us everything is fine." De la Cruz, her 5-year-old son and three other family members survived the blast and made it out of the house with barely a scratch. 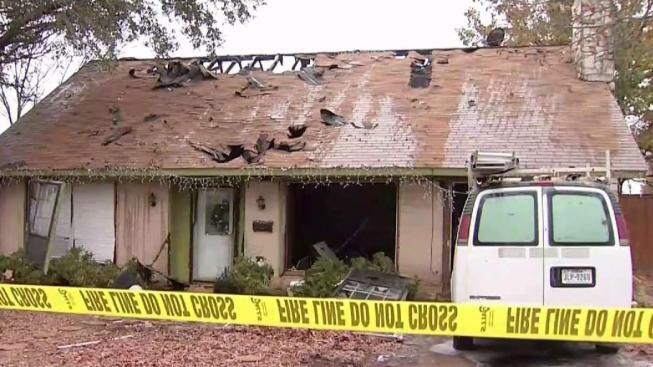 The Irving Fire Department said they didn't evacuate anyone -- even though firefighters were also on the scene – because the Atmos crews told them the leak was under control. "Hindsight is always 20/20,” said Assistant Fire Chief J. Taylor. “We defer to the professionals on scene. Atmos was on scene. They had the scene and they were correcting the situation, they felt, out in the street." He said they learn from every situation but isn't sure what happened will lead to any changes. "It's not out of the ordinary for us to have natural gas leaks,” he said. “It's rare you actually evacuate a house especially in cold situations like this." Neighbors like Marcus Stephenson worry if there's a next time, someone could easily get hurt or killed. "I'd rather be cold than get blown up, you know?” he said. "They're lucky. We're all lucky. We're just lucky. And it wasn't because of Atmos or the fire department either."